As the latest rover arrives on Mars to assess its hospitality, astronomers are learning more about possibly habitable worlds beyond the solar system. IF MARTIANS exist, then any in the vicinity of Gale Crater on the Martian equator are in for a treat. On August 6th, assuming its complex landing system works, a plutonium-powered rover the size of a car will be set down on the surface. This is NASA’s Mars Science Laboratory (MSL), the biggest and most sophisticated rover sent anywhere in the solar system. It is going to Mars for several reasons, but the most publicised part of its mission is to continue the hunt for signs of extra-terrestrial life. Thirty-six years after the arrival of America’s Viking landers, which were designed to see if the Martian regolith hosted alien microbes, astronomers are still unsure if the planet has ever been habitable. The consensus is that Viking found nothing. And Mars is certainly an inhospitable place; temperatures can fall below -100°C, far below those in Antarctica, and an extremely thin atmosphere does little to dampen the solar radiation that bombards a surface as dry as any earthly desert. 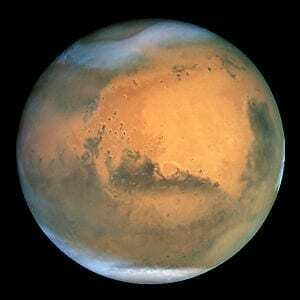 There are reasons to believe that the Red Planet was not always as barren. Data from previous missions left planetary scientists convinced that, in its distant past, Mars was much wetter than it is today. Water is widely thought to be vital for life, thanks to its properties as a solvent. A thicker atmosphere, less eroded by the solar wind, might have allowed large bodies of water to persist for long periods on or near the surface. That may have been enough for life to get started. Geology suggests that primitive life, at least, gets going fairly easily. The first traces of living organisms on Earth date back 3.8 billion years, not long after the planet had cooled sufficiently for liquid water to condense, and soon after the Late Heavy Bombardment, a rain of meteorites that lasted hundreds of millions of years, had begun to slacken off. Some scientists—inspired by the discovery in the 1980s and 1990s of “extremophiles”, bacteria which will happily tolerate blistering heat, crushing pressure, sizzling radiation and other insults on Earth—hold out hope that a few hardy Martians may cling on today, perhaps beneath the surface. If they do, not even Curiosity, as the rover is called, is likely to find them. It carries high-tech instruments, including a laser for vaporising chunks of rock (the better to analyse their chemical composition) and a drill for probing below the surface to explore the chemical record and hunt for any organic molecules that may have survived. It will also examine the atmosphere, paying particular attention to methane levels, which some scientists think may be high enough to suggest metabolic activity of some sort. If it turns up persuasive evidence that Mars could once have supported life, it would be a big discovery and would raise hopes for future missions designed explicitly to look for living cells, such as Europe’s ExoMars rover. Even if Curiosity finds nothing, there are other possibilities within the solar system: Saturn’s moon Enceladus, for instance, seems to have an underground ocean rich in organic compounds. But these days the search for habitable worlds is not confined to the solar system. On July 28th NASA released the latest batch of data from its Kepler space telescope. This is designed to look for “exoplanets” that orbit other stars. Their existence is given away by a tiny drop in brightness caused when a planet transits in front of its parent star, as seen from Earth. Launched in 2009, Kepler’s mission is to stare at around 150,000 stars in the constellation of Cygnus, tallying all the planets it can see to discern just how common Earth-sized, temperate, habitable planets may be.